Free Shipping on Most Orders Over $99! Free Shipping on All Jobst Products! One of the few medical equipment stores in the Minneapolis/St. Paul area, we're open six days a week to better serve you. In addition, you can purchase medical supplies in our online store, twenty-four hours per day. We pride ourselves on providing the best service, selection, and satisfaction whether you visit our physical store in Minneapolis, Minnesota or if you purchase your medical supplies in our online store. 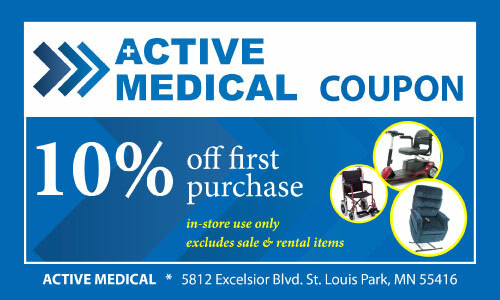 Active Medical is pleased to offer a rental program. 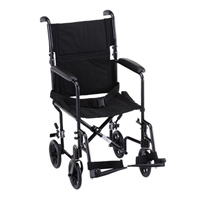 Consider renting if you need a hospital bed, lift chair, knee walker or wheelchair for a limited time. Then, if you are interested in purchasing the rental product, we will apply the first rental charge toward the cost of the item. Simply mention the above coupon when you visit our store for 10% off your first purchase! Copyright © 2013 Active Medical. All Rights Reserved. Built with Volusion.